Ida Isabelle was born on 7 August 1885 (birth certificate number 1884/066597) in Aratapu in the northern Kaipara region. Ida Stanaway in her early 20’s – Daniel Family Collection. 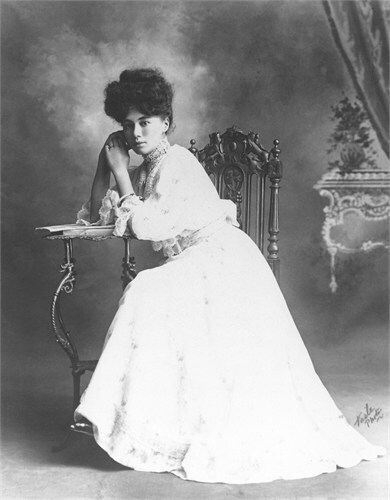 By 1909 she had caught the eye of a young sea captain, Charles Daniel, who at the time was sailing up and down the West coast between Hokianga and Manukau stopping in at Kaipara moving mainly milled timber and other goods. 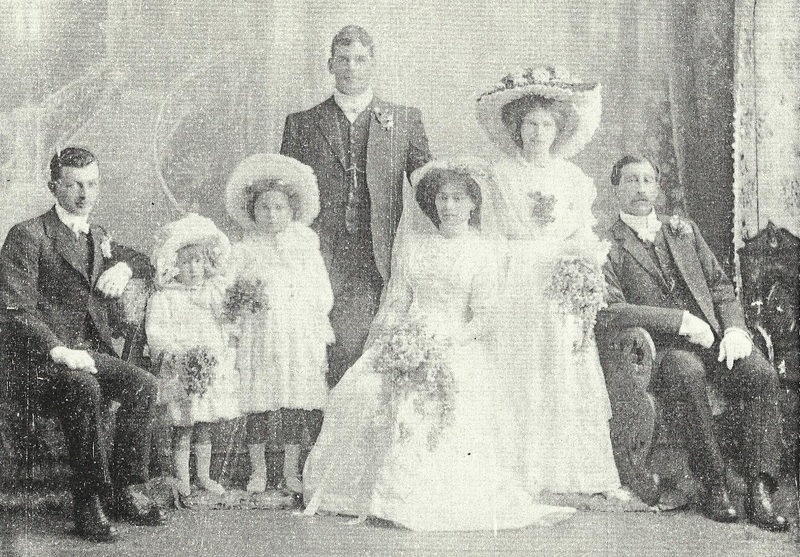 Ida’s Wedding, Jack Stanaway and his daughter are part of the wedding party. – Tides of Time – Editors note – could the holder of this orignal photograph make contact. On 7 August 1910 at the age of 25 Ida marries Captain Charles Bamford Daniel (27) at the Church of Holy Sepulchre on Khyber Pass Road in Auckland (Marriage Certificate number 1910/3945). She is listed as a Music Teacher and Charles is a Master Mariner. They are residing with her parents at 69 Symonds Street, Auckland. Charles Bamford Daniel was born in London on 6 July 1883, the son of Thomas Daniel and Clara Emma Holmes. At the age of one he immigrate to New Zealand with his family and settle in Riverhead north of Auckland. At a very early age (about 13) Charles starts working life on the sea and quickly works his way up to be a coastal Captain shipping flax and timber up and down the west coast of the North Island. It is on one stop into the Kaipara Harbour he meets Ida Stanaway. (A full history on Captain Charles Bamford Daniel is available in another publication by the same author). 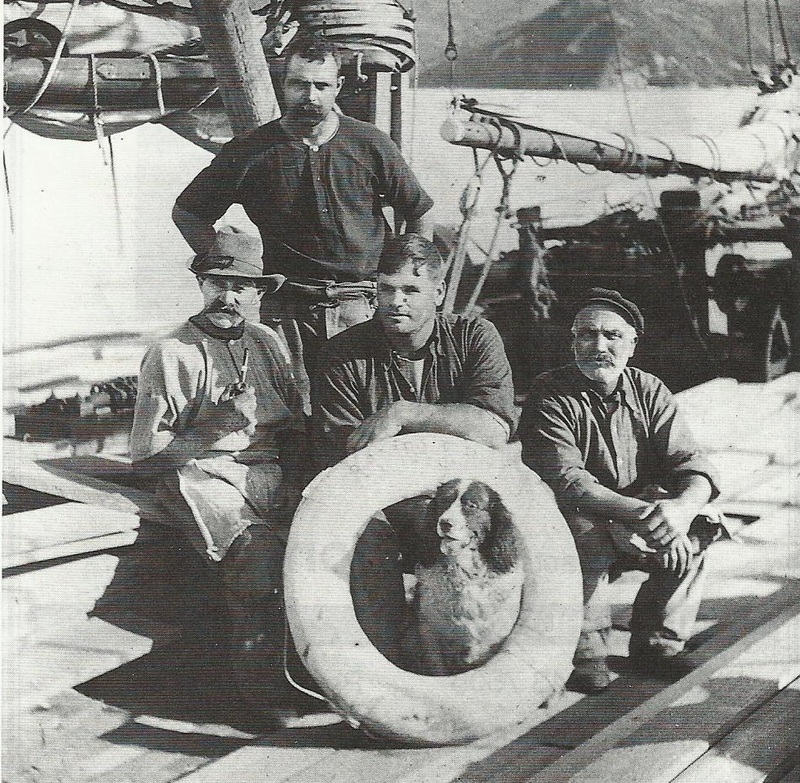 At the time Charles had finished Trans-Tasman sailing and was sailing in scows around the New Zealand coast. Captain Daniel on the scow Rambler – Barney Daniel Collection. From 1912 till 1915 Captain Charles was employed by the Devonport Steam Ferry Company as master of most of their ships at one time or another, all of which were steam. 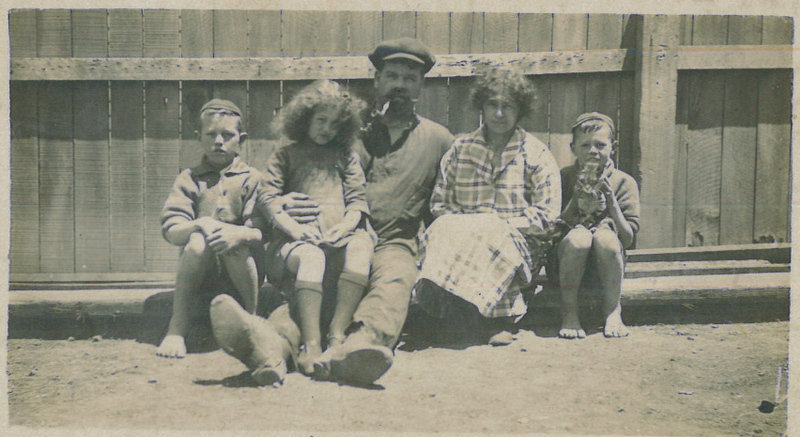 The Daniel family during this time based themselves in Devonport. 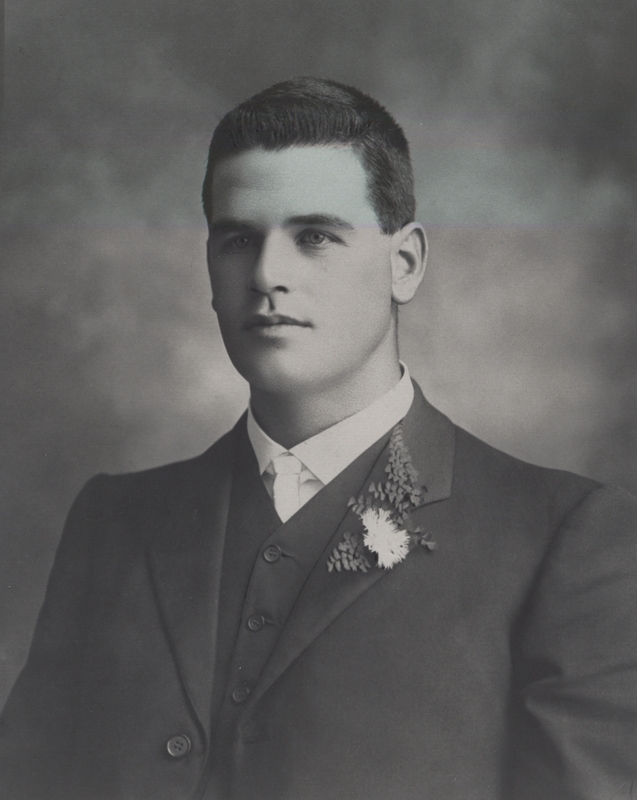 On 7 May 1913 John James (Jimmy) Daniel is born at Devonport on the North Shore of Auckland. On 13 March 1914, May Kakutu Daniel is born at Devonport on the North Shore of Auckland. 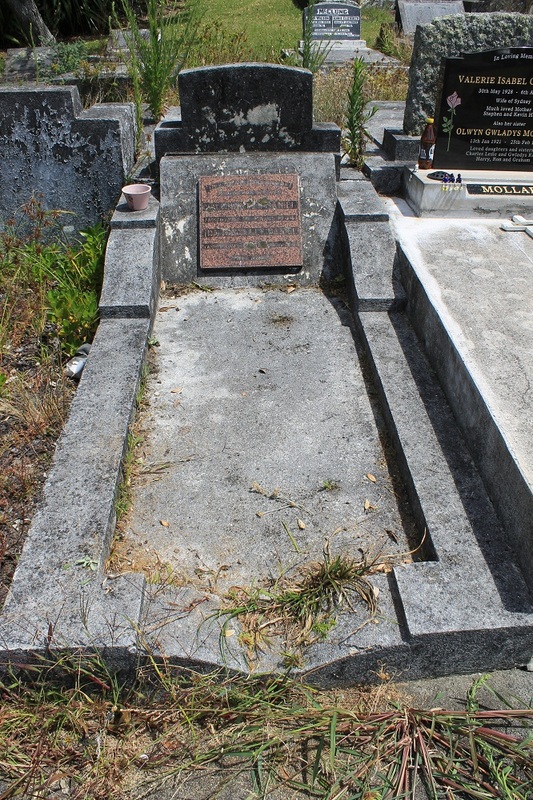 On 23 March 1915 Charles Frederick Daniel is born at Devonport on the North Shore of Auckland, on 12 May 1915 Charles Frederick dies of Spinal Befita, and is buried at the Waikumete Cemetery Anglican Division F Row 8, Plot 42. His grandfather William Stanaway in 1916, and Uncle Montrose Stanaway in 1918, will be buried in the plot next to him. The Daniel Family – Barney, May, Charles, Ida, John about 1920. – Barney Daniel Collection. The Lagoon as it was commonly called was possibly two to three hundred acres in extent, being tidal, uncovering a vast expanse of mud flats and banks at low water. The outlet to the Tamaki was narrow and the tides ebbing or flowing took quite a bit of stemming in a row boat and careful navigation in a power or sail vessel. This was a wonderful place for children and for that matter adults also, being safe for sailing, bathing, and various other forms of aquatic pastimes. To me of course this was heaven, such a vast playground wherein to try out any idea that came into my head, plunder all around just for the taking, sea battles and invasions, voyages of discovery, shipwreck and castaways, that great delight of all boys, fishing, something that even today holds as much pleasure now as then. As the land my father now leased had no dwelling upon it, he had acquired for £40 an old four-roomed cottage that had been part of the early settlement of Panmure by the Irish Constabulary. This was situated on the corner of Cleary Road and had to be removed from this site to our section via Cleary Road, firstly up a gentle slope over the brow of the hill and down the opposite side where our land fronted part way on Cleary Road at the bottom. The great day came for the removal of the cottage, it was the Christmas Holiday period and the Captain had some leave from duty and made a start on this project. Meanwhile he hired from Sam White’s bottle screws and timber Jacks, wire rope, blocks, and a big Kedge Anchor and a couple of long baulks of oregon timber about 12″ x 10″, these being the base of a sledge, as it was by this means, using these as runners, that the house was to be shifted. When these were placed under the house after it had been jacked up high enough, he proceeded to bury the big Kedge Anchor in the ground, rigged the blocks to the house runners and anchor, rove off the wire the fall of the wire going to a set of single trees attached to two great big draught horses belonging to the teamster, Mr Boakes. Well, those horses plus my old man’s ingenuity with the gear, walked away with that old house, so as soon as the tackle was “two blocks” the anchor was dug up and resited again for another heave. As can be imagined this was great fun to us kids, fancy living in a house like gypsies on the road. It took three days to get that house shifted. First day the house was turned and moved onto the road and made ready for the first small rise up to Duffins Place on the morrow which was accomplished by knock-off time, the horses having performed magnificently and the Captain busy digging that great anchor well down to give the necessary purchase to the blocks. The old brick chimney had been removed leaving a sizeable hole in the floor, and my brother and I took great delight in peeing into this area before returning to bed, the things that amuse children when it’s a question of the unorthodox usually relate to matters of modesty that are taboo under certain conditions but are not noticed in cases such as this. Our house now resting temporarily on the brow of the hill on Cleary Road awaiting its descent next day, was the subject of much speculation from the few locals and was not hindering any traffic of man or beast because there was none anyway. Mr Duffin, outside of whose place we were camped, was leaning over his front gate taking in the scene, engaging the Captain in idle chit-chat asked him “What are you going to do with it Captain”, naturally “Big Ears” had to hear the Captain’s reply which was to the effect that he was going to site it on our land, fix it up with a couple of more rooms added, and live in it. “But” said Mr Duffin “You are not a carpenter”. “No” replied the Captain “But I sleep with a carpenter’s daughter”, leaving our Mr Duffin to ponder on that bit of information. Next morning Mr Boakes arrived with his horses and by nightfall the house was in position on our section. The seeming ease with which all this had been achieved confirmed my belief that sleeping with someone whose father was an expert carpenter must be correct because the Captain was no slouch when it came to using tools of the trade. The site of the old house is now the current location of the Panmure Pools. They family stayed in Panmure until the early 1940’s, at which point they moved to 17 Aberfoyle Street, Mount Eden. “Death at Sixty – Captain C.B. Daniel – Inspector of Fisheries – The death has occurred at his residence, 17 Aberfoyle Street, Mount Eden, of Captain Charles Bamford Daniel, senior inspector of fisheries at Auckland, at the age of 60. An officer of the Marine Department for the past 23 years, Captain Daniel was one of the best-known identities on the waterfront. 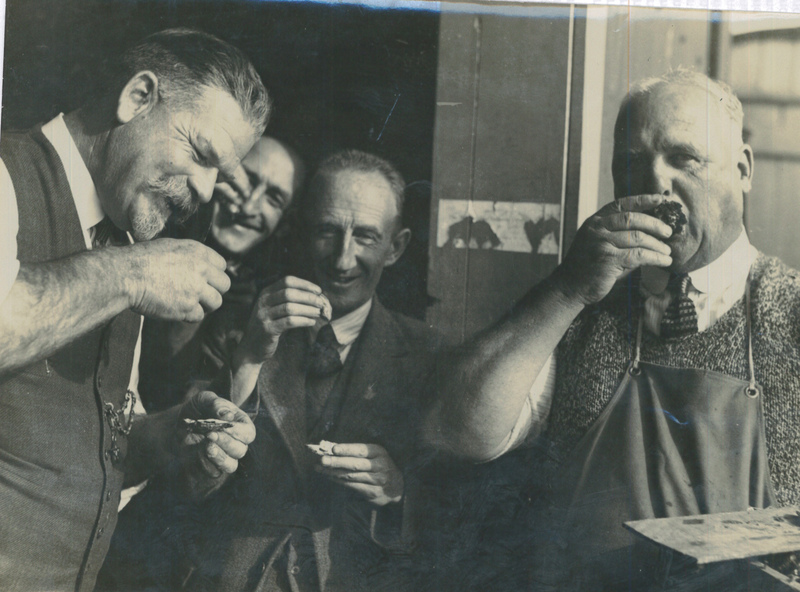 Captain Charles, left Fisheries Inspector sampling oysters – Barney Daniel Collection. Born in England, he came to New Zealand at the age of two, living with his parents at Devonport for many years. He went to sea when 13, serving in square-rigged sailing vessels in the inter-colonial and island trade, until he gained his mate’s ticket at the age of 20. One year later he secured his master’s certificate, and became a well-known figure in the coastal trade as master of one of the heavy sailing scows used at that period. When he was 26, Captain Daniel married Miss Ida Isabel Stanaway, of Northern Wairoa, and sometime later joined the Devonport Steam Ferry Company as shipper of a ferry-boat. Three years later he entered the Government Light Service, and was stationed for a further three years at Hokianga. On his return to Auckland he was appointed to the Government Shipping Office, after a short period with the Union Steam Ship Company, being responsible for crews for vessels operating from Auckland. At this period he was jokingly known as “Shanghai Daniel,” by which name old seamen long remembered him. Ida continues to live at 17 Aberfoyle Street, her son Barney lives next door at number 19. Ida Daniel – Daniel Family Collection. By 1954 she has moved to 28 Staveley Ave, Mt Roskill, until 1963 where she moves to 15 Northland Street, Grey Lynn. Her final move was to the Mosonic Hospital in Mt Roskill where it was said she would remain up until all the other paitents were in bed before she herself would make her own way to her room. Ida and Charles Daniel Grave – Hillsborough Cemetery. 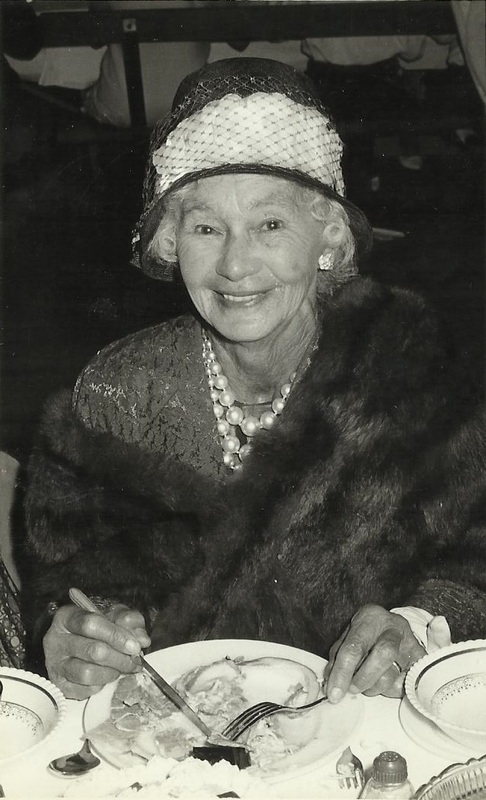 On the last evening of her life she did the same routine, only this time she requested that the nurse get her some cheese, by the time the nurse returned Ida had passed away, the date was 6 August 1977, she was aged 91, only hours away from her 92nd birthday. Ida is buried in the same plot as her husband in the Hillsborough Cemetery, she out lived her husband by over 32 years (Death Certificate number 1977/43107).